GLOGIRLY: Is Summer Ready for Waffles??? WAFFLES: Uuuuugggggaaaaaaarrrrrrgh! MAN, is this peach ever HEAVY! WAFFLES: WHEW! There you go, little peach. Now hurry up and get ripe. It's almost summer. KATIE: Not quite sure how to tell you this, Waffles. But this is no peach. WAFFLES: But Glogirly said! She said we have to get ready for summer and then she gave me this peach for safe keeping. KATIE: She gave you THAT? Or did you just roll it over here from the kitchen? WAFFLES: No, I'm keeping him safe. See? KATIE: It's a watermelon, Waffles. A watermelon. Not a peach. WAFFLES: But it says Peach right here? See? KATIE: Waffles, the only peach around here is your kitty lounger. You know, from Peach Industries? It's got nothing to do with real peaches, watermelon or ANY kind of fruit. You're a CAT. You don't even EAT fruit. WAFFLES: Um, well ... but I can PLAY with fruit. Right? KATIE: You might be ready for summer, Waffles. But is summer ready for you??? 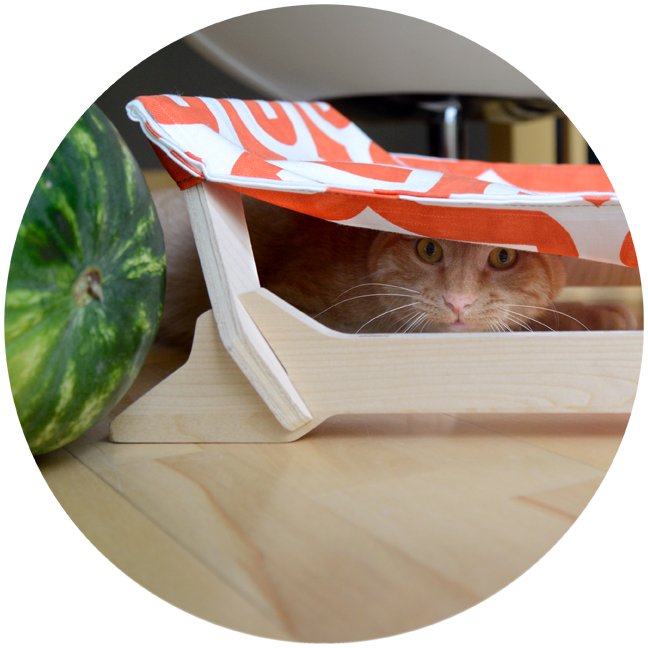 Summer wouldn't be summer without our super-fabulous, super-stylish kitty lounger from Peach Industries. This is their Kitty Lounger MINI. Value priced and purrfect for bird watching, low-to-the-ground-lounging and general stealth & surveillance operations. FTC Disclosure: We received our kitty lounger at no charge from Peach Industries. We also received a small fee to cover the time it takes to take photos and write the blog post. Receiving the free product and the fee did not influence our article or anything we say. All sponsored posts on GLOGIRLY will always reflect our honest and unbiased opinions. That's the safest peach I've ever seen! We don't think anyone is going to get that "peach" away from Waffles. Waffles. Don't let Katie snow you...watermelon is DELISH! Although it makes Mommy farty as all get-out, MOL. Too many fructans or some such nonsense. Doesn't bother me! Maybe Waffles will make watermelon wrasslin' the new summer sport! 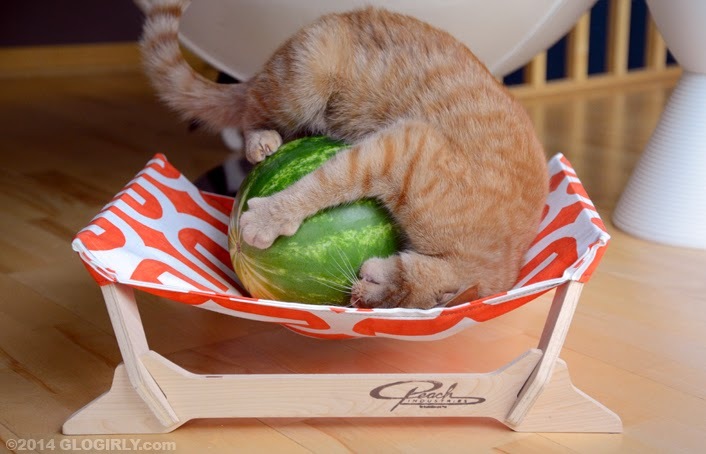 I thought for a while Waffles would try to hatch that watermelon. Mmmmm I could go for some watermelon right about now!!! Ha! Perfect picture of him trying to move that watermelon! Well now that the watermelon has extra holes in it.. you might as well spike it. MOL! 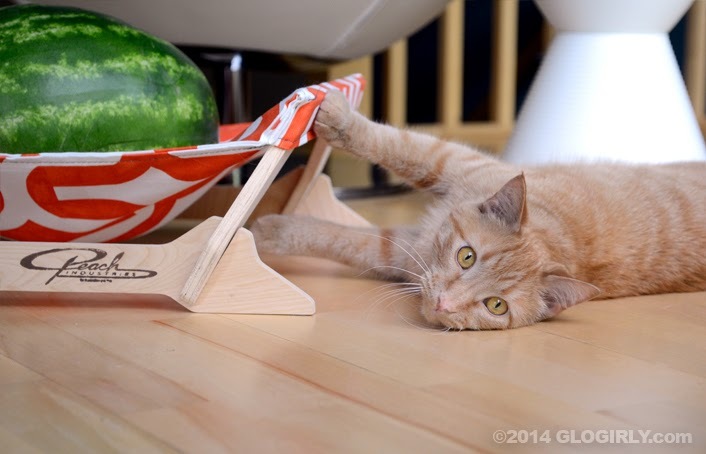 Great pics of Waffles and the melon! Faraday: WOOT, Peach Ball! Yeahhhhh, what's summer without a peach ball? You know, to take out to the peach! MOL - luv da big green peach! MOL we've never seen a peach that looks like that before!! Thanks for a laugh! That's the biggest 'peach' we've ever seen! Summer, watch out! Oh, Waffles, you make us laugh. That's the biggest peach we've ever seen! 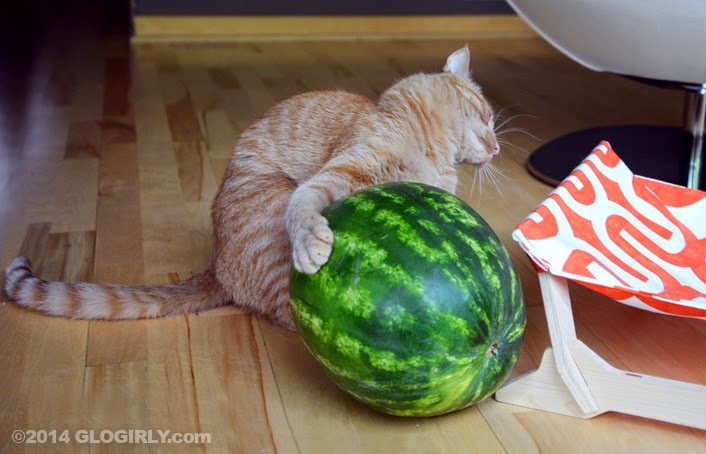 Waffles is a champion watermelon wrestler! 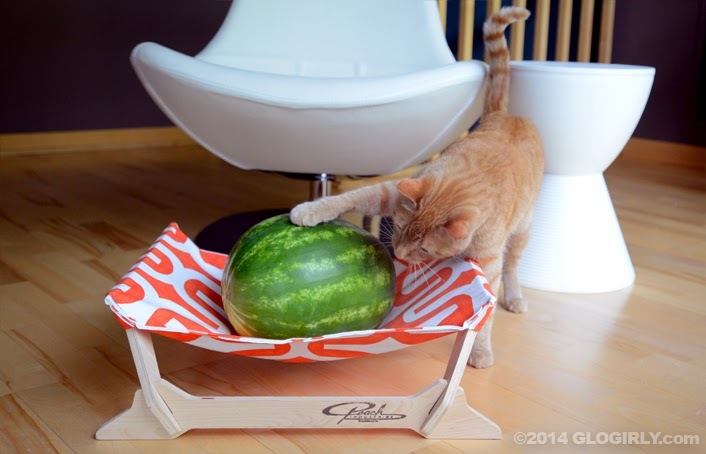 I guess if your cats don't like the Peach Industries lounger, you can always use it to store fruit. Actually strawberries are very tasty Katie, especially frozen you should give them a try. Waffles you are a peach, but honestly boy you are so green it's not even funny. Keep that peach safe Waffles. LOL. Hmm... Waff, we think that 'melon is a bit too much for you to handle - but you get full marks for trying! Waffles, you crack me up!!! We can always count on Waffles for lots of LOLs and MOLs! We want a cute little watermelon like that too! That should keep Waffles entertained for a while! 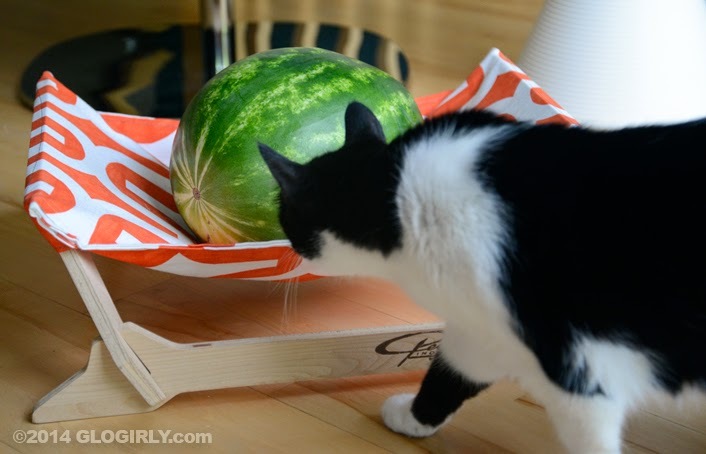 Waffles did Glogirl spray catnip all over that watermelon? We loved how she was able to get you to play with it! LOVED!!! That is one peach of a Wafflesmelon! I am still LOL! Waffles, you are something else! I couldn't help but notice how nicely watermelon green goes with boy tabby orange. Magnificent - pure decorator tones. My Catness Waffles you really can Man-Cat-Handle that huge, um, cat toy! Wonderfur post by the way. Really a double plus good! The photos on this post absolutely crack me up. This has to be my favorite post ever! Don’t give yourself a hernia, Waffles. Did GG rub it with nip? Now TW wishes she’d bought that watermelon at BJ’s. HAH! Those are some very funny photos - And aren't orange cats THE MOST photogenic creatures on the planet? My mum gets lots of those watermelon peaches Waffles, but I've never tried wrasslin them. That's the next thing on my to do list. Oh Waffs you crack us up!! Waffles, you is funny! 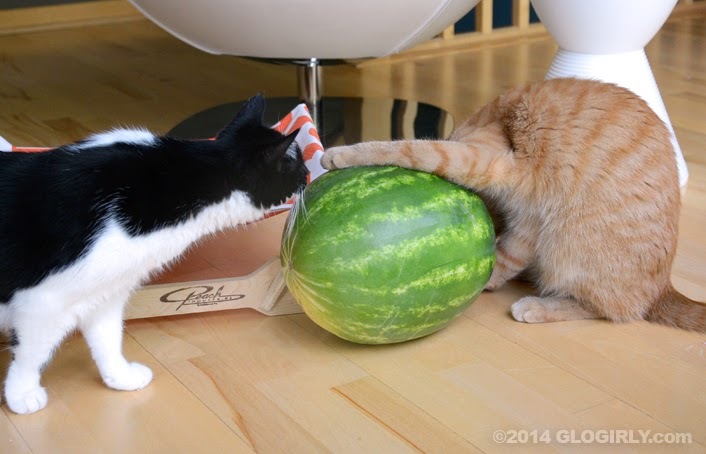 Watermelons aren't for wrestling, MOL. Don't you know you should take the fruit out of the watermelon and then wear it as a helmet? Mom bean promises she'll find a picture and put it on our blog! Keep that big green thing under control. You are sooooo silly Waffles. You sure did put the smackdown on that watermelon, oh I mean peach, though!